High-efficiency heating systems are essential for keeping utility costs low and maintaining ideal home comfort levels. At Green Energy Mechanical we install and service energy-efficient gas boiler systems. We proudly serve Massachusetts, including Randolph, Weymouth, Brockton, and areas nearby - contact us today to learn more! Old-style boilers require a chimney connection to vent hot combustion gases out of the home. In the process, heat indirectly escapes, meaning your system will have to work harder and longer to regulate home temperatures, which costs you more. Natural venting boilers usually run at a 50 to 80% efficiency rage, while newer, self-combustion systems have a 94% rating. With over 10 years of experience, Navien is the industry leader in condensing technology. 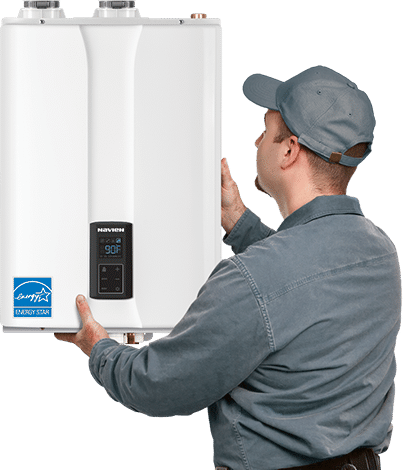 They provide state-of-the-art combi-boilers, boilers, and tankless water heaters, and their ingenuity and reliability has received international recognition. The Navien Condensing Gas Combination Boiler (NCB-E) series offers the perfect solution for customers looking for efficient hot water and home heating. Hydronic heating is silent, clean, and effective, and Navien's combi-boilers only enhance the positive effects of this type of heating system. Founded 100 years ago with a dedication to providing reliable, efficient, and sustainable heating and solar technology, Viessman is an industry leader continuing to make responsible boilers and other products. They are a three-generation family company that is still growing and innovating. Viessman specializes in many kinds of high-efficiency boilers. These include gas-fired condensing boilers, oil-fired/ gas-fired boilers, biomass boilers, and more. Are your costly energy bills a result of your faulty boiler? The home heating specialists at Green Energy Mechanical can help with highly efficient gas boiler installation, replacement, and repair services. We proudly serve Randolph, Weymouth, Brockton, Easton, Quincy, Canton, Cambridge, Braintree, Newton, Boston, and areas nearby in Massachusetts. Schedule a free boiler service estimate to see how upgrading your old unit can benefit your home!